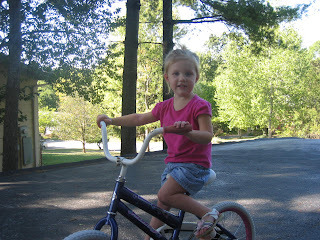 I recently bought a bike for Laura at a consignment sale for $10! I was quite proud of my good deal. Laura is loving riding it and doing a great job at it. 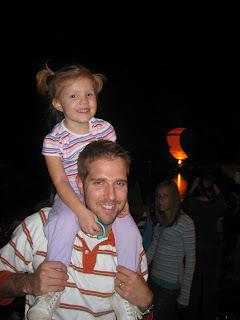 We went to the annual balloon glow this past Friday night. While it didn't blow us away, it was fun family time. On another note which some of you can appreciate, Laura went poop on the potty tonight for the first time! We were all so excited. Tomorrow she gets to pick out a new toy for her accomplishment. I hope it will continue!! Yeah! I am glad to find you guys. I hope all is well. Congrats on baby #2 and "poop" in the potty. That was a huge accomplishment at our house. We actually had a party and invited some family and good friends. Even better, our good friend, called the radio station on the way to our house to have them tell her congratulations for her accomplishment. We had told her when she did it we would have a party and we did...cake, balloons & even the radio announcement!! Congrats on the poop. Thats a phrase I never thought I would say. But I guess as a parent that is a pretty common phrase. 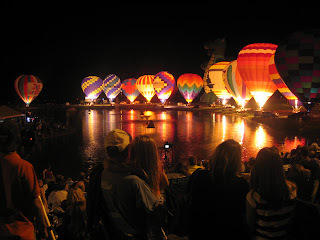 The photo of the balloon is cool! Yah for Laura! That is great news for everyone involved, esp. when you don't have to clean up afterwards!! 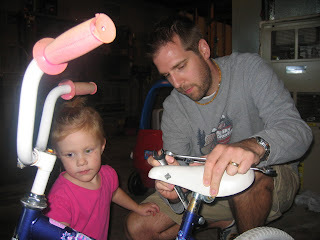 Don't you just love the bikes that you find in great sales...we have passed on Grace's $7 garage sale bike to Susie now and she loves it too....Aaron said that we have to either spray paint it or buy a new one for Parker, though...Why wouldn't a little boy want a barbie bike? She looks so big riding! Fun family times!!! Sounds like lots of fun is going on at your house. I saw your comment about the lo mein. You can actually click on the words "No Pain Lo Mein" and it will take you to our recipe blog where the recipe is listed. I got it from Rachael Ray's cookbook called Classic 30 minute meals.